How often do you go through your day without even thinking? The drive to work, your work day, cooking dinner, watching the TV. There are so many things we do every day without even thinking. This becomes comfortable for us and creates our comfort zone. It is so important to know how to expand your comfort zone so you can push yourself to achieve more in your life. To get to know what your current comfort zone is journal about what you do daily and what feels comfortable to you. This will show you what your comfort zone is. You can then work on expanding it and pushing yourself into new situations. Here are a few ideas on how to expand your comfort zone. There are so many ways you can do this that are really simple and easy. Do something every day to push yourself outside your comfort zone. It only has to be something small but it will all contribute to expanding your comfort zone. Make a list of everything you’d like to do outside of your comfort zone and schedule time for it every week. For example, if you want to improve on social situations you can plan to put yourself in more of those situations. You can arrange to meet friends and eventually work on going out alone to meet new people if that’s something you want to work on. What does your life look like a year from now? What is your new comfort zone? Write a list of everything you want to achieve long term and set a deadline for this. Remember to use the SMART technique for this. Make your goals specific, meaningful, achievable, realistic and time bound. For more details on this and how to set them read the blog post below. Then from these long term goals it’s time to get specific on how you can achieve these. Using the same example of social situations you could arrange to go to new places to meet new people, join a club, visit the library or another public place with people of the same interests as you. Schedule a time for these into your week and commit to trying it for a certain period of time to try it out. Some you may enjoy, some you won’t. You can adjust your goals to suit what you enjoy once you have tried them for your trial period. 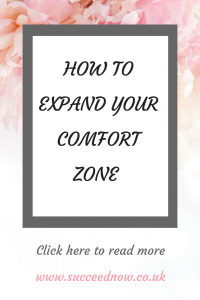 I hope these ideas help you and you look to start working on expanding your comfort zone. Let me know how you get on. Do you currently wake up facing thoughts of doubt and feeling sick? Not knowing where to start with improving the way you feel? Imagine waking up feeling free and in control of your own life. Waking up feeling happy and ready for the day. Being able to confidently face anything that is thrown at you. Knowing fully how to feel free. I love this!! It’s so easy to get caught up in routine, but I always notice that making those tiny changes can make all the difference! #3 and #7 have been huge for me! I had done something similar when I was a teen in order to push myself into exploring new hobbies. I can totally relate to this. Only when you make an intentional effort do you discovering new things about yourself. Change is always good. I think writing down your comfort zone is a great idea. Helps you to get an understanding of where you need to push the limit. I struggle with comfort zones. i found this article extremely helpful.